“Grisha’s Loop,” also titled “My Slavic Saga,” is authored by Marsha Samoylenko Denison and her father, Gregoire Ivanovich Samoylenko. It is Samoylenko’s partially completed autobiography, completed to the extent possible by Denison. 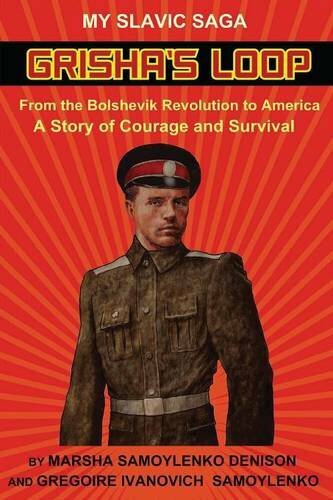 To the extent completed it is a fascinating account of a young man growing up in Imperial Russia, a witness to the Bolshevik Revolution, a participant in the Russian Civil War, and a refugee who ended up in America. The book has three parts. Part I is Denison’s introduction to her father (known as both Gregory and Grisha), and the historical context for his autobiography. He wrote it in the 1930s and put it away in a box. Denison opened the box decades later, and even more years later wrote “Grisha’s Loop.” Part III is Denison’s story of Samoylenko’s life in the United States. Unfortunately, Samoylenko never finished the autobiography. He did leave an outline for future chapters, which left many questions and mysteries. Outline entries for “arrest,” “fall from aeroplane,” “first battle,” “back to Ochakov with prisoners,” “fall of army,” and others, makes one wonder what he actually went through and witnessed. Denison attempts to fill in the blanks of her father’s story through family lore and other documents, but this cannot compare to Samoylenko’s own words. Part III, Samoylenko’s life as an American, is the book’s weakest section, filled with photos and information, which only his family would appreciate. The book’s titles and subtitles are confusing, with “Grisha’s Loop” being Denison’s title and “My Slavic Saga” being Samoylenko’s. And two subtitles are a bit much. Denison, though, does an admirable job of connecting the dots left unconnected by her father. Samoylenko’s voice, coupled with the historical events witnessed, makes “Grisha’s Loop” and “My Slavic Saga” much more than one man’s saga. It is indeed fortunate that Marsha Samoylenko Denison rescued the autobiography from her father’s box.